Kugels made with matzo for Passover are a relative newcomer to the ancient world of kugels. Centuries ago, the earliest kugels were made from bread and water and were savory rather than sweet. They most likely were baked in a round pan, which explains their Yiddish name, kugel, meaning ball or sphere. About 800 years ago, Jewish cooks in Germany replaced the bread with noodles, added eggs and baked the mixture in a square or rectangular dish and called it lokshen kugel. When Eastern European Jews immigrated to America, they brought their old recipes with them and through the years began experimenting. 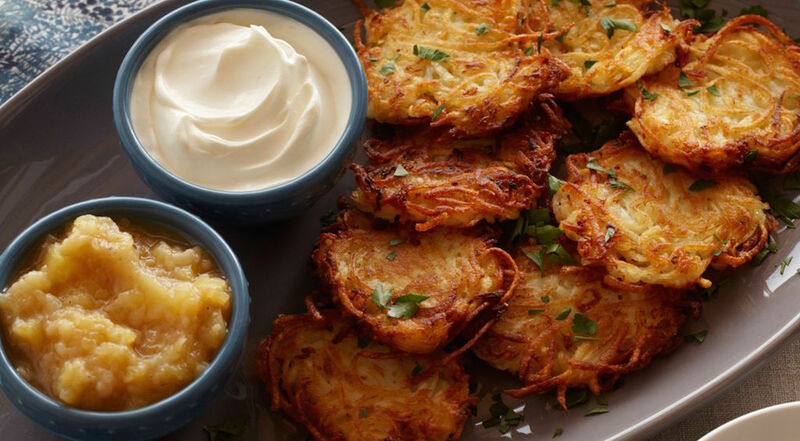 Potato kugel became popular not only because it’s crisp and delicious, but also because it can be made without dairy and served with meat dishes for those who keep kosher. Somewhere along the line, matzo or matzo meal was used in place of noodles and flour to make the kugel appropriate for Passover. *To give this recipe a Sephardic touch, add dried cranberries or apricots. Soak farfel or matzo pieces in water until soft. Drain but do not squeeze dry. Beat eggs with salt, sugar, melted butter or margarine and cinnamon. Add to matzo mixture. Stir in chopped nuts, chopped apples and raisins. Dot with additional butter or margarine. Bake using an 8×8 inch square pan in a moderate oven (350 degrees F) for 45 minutes or until lightly browned.